Some lawmakers and city leaders on Monday proposed strengthening the state's gun laws. Gun safety advocates say Connecticut already has the second toughest gun laws in the nation. 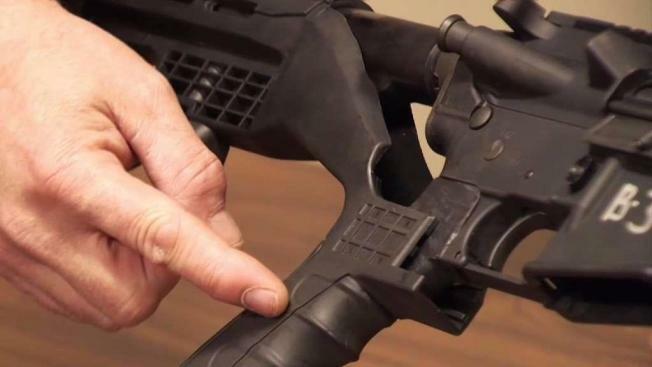 With the legislative session about to begin in Hartford this week, some lawmakers want to make them even tougher by banning bump stocks and so-called "ghost guns." Massachusetts and New Jersey have already banned bump stocks since 58 concertgoers died and hundreds more were injured in the Las Vegas mass shooting last October. Investigators say the gunman modified his weapons with bump stocks to make them fire like they are automatic weapons. "There is no legitimate reason to have a bump stock," Jeremy Stein, executive director of Connecticut Against Gun Violence, said. "It is not used for hunting, it is not used for self-defense." The co-chair of the Judiciary Committee Rep. William Tong announced Monday afternoon the plan to introduce legislation outlawing bump stocks and ghost guns in Connecticut. "It has no serial number, it is not registered," Tong said of ghost guns at a news conference in New Haven. "This is a real threat to our communities." Ghost guns are partially completed weapons that can be purchased without a background check. Owners finish the assembly to make them working firearms at home. "Now this source of gun is particularly attractive to people who can’t legally acquire guns in our state," Stein said. The gunman in the November 2017 mass shooting in Northern California bi-passed a court order to prohibit him from having guns by building at home two of the four weapons used in the rampage. "It’s quite shocking to me that number one that you’d want to do this and second that you would be able to build your own gun," Carol Wade from New Haven told NBC Connecticut after the news conference. In voicing opposition to these proposed laws, President of the Connecticut Citizens Defense League Scott Wilson cited an NBC Connecticut Troubleshooters report that found charges for stealing a gun were dropped more than 70 percent of the time over the last five years. "Instead of politicians having the fortitude to impose harsher penalties for violent criminals and possession of a firearm by prohibited persons, society gets more "feel good legislation," Wilson said in a statement to NBC Connecticut. "The recent report published by the Office of Legislative Research demonstrates that too many felony gun charges are simply reduced or dismissed altogether, and therein lies the real problem. Our lawmakers are simply not sending the proper message to criminals. instead, they are passing more laws that will accomplish nothing of substance." Last month, Governor Dannel Malloy announced his support for a bump stock ban. The General Assembly’s legislative session begins on Wednesday.